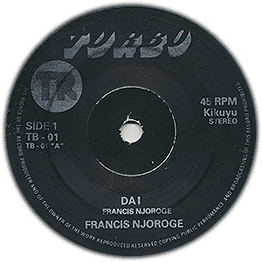 By the time multi-instrumentalist Francis Njoroge released his first solo single, he’d already been recording for more than a decade. An early trace of his musical activity is found on a classic Zamrock album ‘Soweto’ by Rikki Ililonga, recorded in Nairobi and released in 1977. A founding member of Afro disco/funk/rock group Makonde, it’s the track ‘Manzara’ (catapulted to b-boy classic by Afrika Bambaataa and Jazzy Jay back in 1977) that’s become Francis’ most well-known song worldwide, although until recently he was not even aware of the fact. When Makonde broke up in between a European tour and a US gig that never happened, he joined the African Heritage Band, one of the hot new names on the Nairobi live scene at the dawn of the 1980s. Shortly after a European tour he quit the band to take up a gig at a new night club in town. Together with fellow Makonde veteran Sammy Kasule he then formed a new group called Radi whose music leaned on boogie-funk. Another project in the ‘80s was Jabali, whose ‘Folk Song (Kanyoni)’ was an audience favourite. Musically it sounds like a stepping stone towards the sound on ‘Dai’, with its drum machine, synth bass and poppy arrangement. The latter was a full-on dancefloor oriented track that came with a dubby remix on the flipside. And where ‘Folk song’ mixed English and Kikuyu lyrics, Dai (‘riddles’) was all Kikuyu: a lyric urging the young generation to maintain the tradition of telling riddles. Originally released on the small Turbo label as a 45, it had disappeared into oblivion until last year when we dug up a copy in a Kikuyu ex-DJ’s private collection in a wooden cottage outside Nairobi.